Jordan Gates of Megaphone Agency is back with another great post on the topic of booking shows. Is there something you’d like to contribute to the blog? You can find our guest post guidelines here. With that, here’s Jordan to fill us in! Booking shows can be difficult, especially if you don’t have an experienced booking agent working with you. If you are lucky enough to have an agent, it can be a game changer. A good booking agent can help find bigger opportunities, increase your earnings, and fill more dates. Agents are scarce though, and there are way more talented artists around than there are reputable booking agents. Most artists start out booking their own shows early on in their career. This can be a time-consuming and sometimes frustrating process. There is a lot to consider, like finding the right venues to play, scheduling dates, and striking a fair deal. 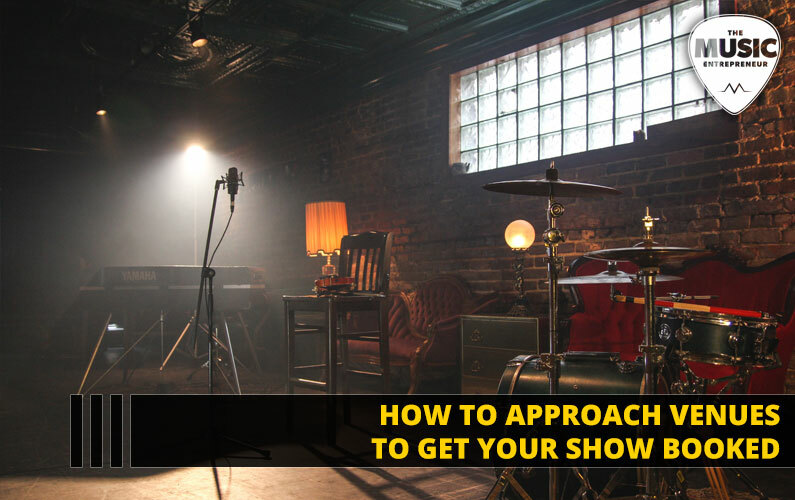 Knowing how to properly represent yourself to venues and get booked is an essential skill for independent artists. There is no definitive playbook for getting gigs, but here are some things that can help get your foot in the door. Before you start reaching out to venues, do your homework and create a plan. Figure out where you should be playing and why you want to play there. Ask yourself how each opportunity will benefit you and fit into your overall strategy. Seek out opportunities in the right venue at the right time in the right market and for the right price. Choosing the right venue means one that aligns with your genre of music and one that is an appropriate size for how many people you can draw. If you are in a four-piece rock band, you probably don’t want to play in a small coffee shop that typically books acoustic singer/songwriters. You also shouldn’t be playing in a big music hall or theater unless you can draw enough people. It may sound cool to play in a bigger venue, but if you can’t fill it, it will make you look bad and the venue will lose money. Picking the right time to play a show is also important. Pay attention to day of the week, time of year or seasonality, other events that are happening, and timing of your own music releases or other notable milestones. In a perfect world, you would be playing Saturday night on a beautiful summer evening where you’re the only entertainment in town. Of course, you won’t always be that lucky, but aim for dates that work for both you and the venue. Picking the right place to play is more than just the venue, but also the market or city you are in. It doesn’t make sense to drive across the country to play to an empty room in a city where no one knows you. Choose markets carefully and develop them strategically over time. Developing a fan base in your home town is important, and then work your way out to nearby cities or other locations where you know you have fans and listeners. Price is another key factor to consider. This includes the ticket price for the show and also your own compensation. Know what you are worth to the venue and to your fans. Think about the size of the venue, whether you have played in the market before, and price sensitivity of your fans. You will likely set ticket prices differently for a show in New York City than you would for a small college town. Make sure you are also being compensated fairly. Being able to sell more tickets should translate into earning more money for your performance. Pay attention to the terms of the offer you’ve received as well. Make sure you are getting a fair deal whether it’s a flat guarantee, percentage of ticket sales… or just free drinks. There is no silver bullet to get an instant response from a talent buyer, but there are a few best practices you can follow. It is hard enough to even get a talent buyer’s attention. They get flooded with booking requests every day. So, when you do have their attention, make sure you are getting your point across and making a clear case for why they should book you. When contacting a venue, you should present yourself in the most appealing way possible, communicate with the right tone and format, and be concise. Provide the best information you have available to the venue. Obviously they are going to want to hear what you sound like, so be sure to link to somewhere they can listen to your music. They will also be paying attention to your marketing presence and the quality of your live show. Take the time to keep your social media pages updated and highlight any recent major achievements or press coverage in your message. It is also a good idea to provide links to high-quality live performance video. Additionally, any past show history or ticket sales in the market would be great to include. The main goal is to highlight your most positive qualities to be attractive to the venue’s booking person. Don’t be afraid to brag, but definitely don’t lie about your stats. Your message should be sent with the appropriate tone and format. Be professional. Use complete sentences, and don’t ever come across as arrogant or entitled. You will get a better result if your message has a more respectful tone. The format is important too. A lot of business is done over email, but some talent buyers may want to communicate over the phone instead. Make it as easy and friction free as possible for the talent buyer to review your message. They will be more likely to respond to a message that is to-the-point and has all the key information they need to make a decision. Packaging all this information into a well-crafted message can be an art form in itself. Keep your message direct and concise. At this point, you should know what you want, so be purposeful with your request. Prove that you are the right fit for the venue, and suggest available dates that work for you. Try to condense the message to make it as concise as possible. It should only take a few sentences to get your point across. Your music and other links will speak for itself if the talent buyer wants to find out more. Finally, don’t be afraid to follow up multiple times. Be persistent, but not annoying. If you are truly a good fit for that venue, they will be in touch. Jordan Gates is the founder and President of Megaphone Agency. With experience in marketing and music business, Jordan has a keen eye for branding and a sharp ear for musical talent. He is passionate about all types of music and has been privileged to work with some of the industry's top new artists.